This week Alisa’s weekly Travel Theme: Close-Up is all the encouragement I need to post another view of the unusual curved sides of the Experience Music Project Museum at Seattle Center. This museum is dedicated to the history and exploration of music, science fiction and popular culture and its unique appearance has anchored this corner of the center since 2000. When Frank O. Gehry began designing EMP, he was inspired to create a structure that evoked the rock ‘n’ roll experience. He purchased several electric guitars, sliced them into pieces, and used them as building blocks for an early model design. An endlessly fascinating structure! Love this series! Inside has big open spaces with a minimalist look. There are some great studio spaces where kids can learn how to play electric guitars and make their own rock videos. The gallery spaces are nice too. Such a remarkable creation this building. I love the lighting you have captured reflecting on some of those 21 thousand shingles! It is definitely a one of a kind structure, Sylvia! Remarkable photo of the great museum! I really like the angle you took, Lisa! Gorgeous blue color. What a genius (and artist) Gehry was! Amazing building and beautiful photo, Lisa! You can ride through this? Yes, they built the museum around the end of the Monorail run so it goes right through the building. Looks like fun! 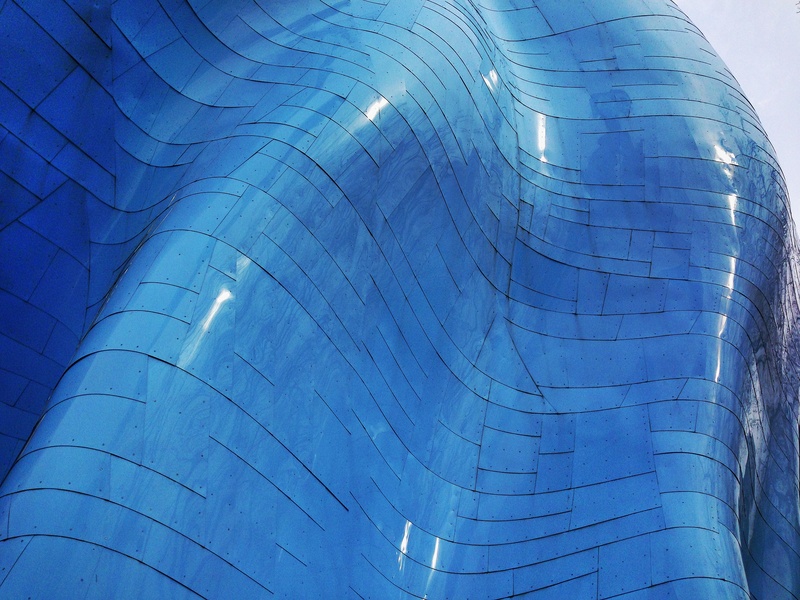 Cool Blue – Gehry’s buildings are just so innovative! Thanks, Linda, amazing is a great word! Reminds me of buildings in Afghanistan with roofs tiled in lapizuli. That sounds like a beautiful view.